Ann Rice, acclaimed creator of the southern-gothic vampire genre, (which is currently roaring full bore in sales...especially among teen to YA women), though her Vampire Chronicles series, is following up her first journey into Christian Fiction (Christ the Lord: Out of Eqypt: http://www.annerice.com/ChristTheLord-OutOfEgypt-Editions.html), with a new memoir detailing the rebirth of her faith. I was so touched by her presentation in Christ the Lord, that it inspired some of the storytelling direction I took with Eye Witness: Acts of the Spirit (http://www.headpress.info/eyewitness2.html) and Eye Witness: Rise of the Apostle (http://www.headpress.info/eyewitness3.html). Her memoir is to be followed up with a new series of books chronicling the early ministry of Jesus. Where are those Christian Comics? I share your frustration on this issue, my brother. As someone who has been creating a Christian based graphic novel series since 2002, I've ran across many of what I call "Closet Christian Creators" in the industry, who commend me for taking a stand for Christ in what I am doing. Many also tell me they'd love to do likewise, or have a story they've wanted to create for years, but that there is just not an outlet (I.E. a publisher) for them to bring it to market. In fact one writer (who shall remain nameless) who was the creator of one of our more high-profile and more "demonic characters", is among that group. You've got to remember that most people working in comics are not like movie or TV directors and/or actors....who make enough through their trade to be financially independent. Most are working stiffs who rely on their monthy assignments to pay their car payments and mortgages... like most of America. And so this doesn't give them the opportunity to take months to years to underwrite creating their spiriutal or Kingdom honoring project. Sorry to say but it's just simple economics. That's why now most of what is being created comes from either very small press publishers, who only publish a title or two a year, or the creators themselves through self-publishing. Part of my goal through the Eye Witness series, has been to create enough attention and buzz within the comic and book trade to demonstate both to the retailers and publishing community that the paring of spirituality and comics/gn's can work, does have a massive willing audience and will sell if given a quality product. Once that is established and the money is flowing through the system...so to speak, then you'll be amazed at how many books/stories you'll see roll out. But the good news-bads news scenerio will then be...will they be published for the right reasons once the big-boys are involved, that is to say will the spirit which drives many to follow this path, be corrupted by an industry who's bottom line is the bottom line, rather than outreach. Just some food for thought. 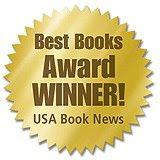 Dallas, TX – USABookNews.com, the premiere online magazine and review website for mainstream and independent publishing houses, announced the winners and finalists of THE 2008 NATIONAL “BEST BOOKS” AWARDS, (NBBA) on October 20, 2008. Robert James Luedke’s Christian based book, Eye Witness: Rise of the Apostle, (Head Press Publishing, 2008: http://www.headpress.info/eyewitness3.html), was honored as the Winner of this award in the category of Comics: Graphic Novels. Luedke created the Eye Witness series, as a way to share the spiritual, historical and dramatic nature of the Bible, in a way that is both attractive and entertaining...especially to teen and young adult readers, who may not attend church or read the Bible, but are avid readers of comics, manga and graphic novels. His unique combination of a Biblical adaptation with a modern day action-thriller has proven successful not only in comic outlets, but also with mainstream and Christian booksellers. This is the third major book award that Luedke’s Eye Witness series has garnered. In 2007 the second book in the Tetralogy, Eye Witness: Acts of the Spirit, (http://www.headpress.info/eyewitness2.html) was a winner at the Hollywood Book Festival in the category of comics/graphic novels (http://www.hollywoodbookfestival.com/past.htm) and a silver medalist at The Independent Publisher Awards in the category of Dramatic Graphic Novels (http://www.independentpublisher.com/article.php?page=1157)...not to mention being chosen as a finalist for the FOREWORD MAGAZINE book of the year awards. Jeff Keen, President and CEO of USABookNews.com, said this year’s contest, now in its fifth year, yielded an unprecedented number of entries, which were then narrowed down to over 500 winners and finalists in over 140 categories. A complete list of the winners and finalists are available online at http://www.usabooknews.com/. Winners and finalists traversed the publishing landscape, from large publishing houses: Simon & Schuster, Tarcher/Penguin, HarperCollins, Hyperion, St. Martin’s Press, McGraw-Hill, John Wiley & Sons…to hundreds of independent publishers, including Head Press Publishing. I just wanted to let everyone know about my upcoming book signing events...which should be the last of my promotional appearances for Eye Witness (Book Three): Rise of the Apostle. After this, it's back to the studio to being work on Eye Witness (Book Four): The Unknown God. Look for me in the exhibitors area, booth 118, just off the intersection of the Capital Driveway and Colorado Street. A week later, on Nov. 7-9th, I'll be in Arlington, TX...for Wizard World Texas. This is the largest pop-culture convention in Texas and will feature people involved in the world of: Movies, TV, comics, graphic novels, movies, gaming, video gaming and collectibles. For more information, visit: http://www.wizardworld.com/home-tx.html Look for me in the Artist's Alley area. Award-winning graphic novelist, Robert james luedke, will be a featured guest on the talk show, "Everyday with Marcus and Lisa", this Friday morning (Oct. 3rd), from 10am to 12noon. Robert will talk about his journey over these last 6 years creating the Eye Witness graphic novel series, and his latest release, Eye Witness: Rise of the Apostle (http://www.headpress.info/). The show is produced by FamilyNet TV, which is available around the county on most cable systems (especially Verizon and ATT), as well as on the SkyAngle Network.